"I believe in you. You have a great destiny. You are meant for great things. And it s possible to live a wonderful, extraordinary life." That is the promise offered by bestselling author and illustrator James A. Owen in this remarkable and inspirational meditation. In Drawing Out the Dragons, James shares personal stories and the deep truths he learned while navigating past obstacles and adversity toward a life of lasting belief and joy. We all have a grand destiny, but sometimes we feel we lack the power to achieve it. But we always have the power to choose. Every drawing, every life, is nothing but a series of choices and actions. Make your lines. Make your choices. . . . What you create from there is entirely up to you. 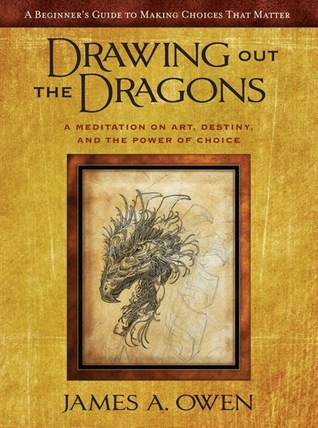 Drawing Out the Dragons has the power to uplift, inspire, and change your life. Sometimes in life, you get what you need just when you need it. For me, that was the case with Drawing Out the Dragons. I was chin deep in a depression that was threatening to swallow me whole and me, being me, posted about it on my blog. It wasn't much later that I received a Facebook message from someone reminding me that they'd sent me the pdfs of not only this book, but the other two in the series. Little did either of us realize, but I'd purchased the Kindle versions back in 2016 and forgotten all about it until I found my Kindle and they were right on top staring at me. Never one to ignore such blatant hints from the universe, I curled up at the park one day and started reading. I didn't stop until I'd finished this book. Why? Because every page spoke to me on some level. James has been through some horrendous things, but it wasn't his difficulties that had me. After all, I've long said that everyone of us on this planet has a challenge or challenges to overcome. It was the ways in which James overcame them. He never quit. Here I was contemplating the value of my own life and James is screaming from the rooftops that it's okay and that no matter what, he isn't going to let me fall. Sometimes, when everything seems the darkest, all it takes is one person saying hey, I believe in you. Sometimes all it takes is seeing how someone else survived and thrived to make you sit up, take some deep breathes, and say, "Okay world, let's give this another shot." Thank you, James...for reminding me that I can do this and like you say in the book, "Always, always ask for what you want. Because the Universe might surprise you — and give it to you.” I'm hoping to someday be able to ask for one of those Dragon pictures because I want it to serve as a reminder of what I can do in this world.